The Terror didn’t end tonight. It died. That’s the best way to make sense of “We Are Gone,” the tenth and final episode of this brutally humane series, that I can come up with. More so than anything else on television in recent memory—ever, perhaps?—The Terror is about the experience of death, because the story requires virtually every character we meet to die before the end. Much of that die-off happens here, tonight. It happens onscreen and off, spectacularly and quietly, peacefully and gruesomely, by suicide and murder and disease and starvation—and, of course, a gigantic demonic bear. Death is like a prism turned around in The Terror’s hand, showing every facet, never settling on any one of them as the force’s true face. Some of those deaths feel fitting, whether as noble tragedy or poetic justice. Take poor Dr. Henry Goodsir, previously the show’s voice of hope for humanity. All the hope has gone out of him, now that he’s been forced to pervert his medical training and preside over the butchery of murder victims for human consumption. The arrival of his captain, Francis Crozier, in the camp as one of its commander Mr. Hickey’s prisoners seems to cement his resolve to die on his own terms—and to kill as well. After warning the Captain only to eat his feet should his body be served as a meal—a plea that sounds like madness with no other context—Goodsir slathers his body in poison, drinks a stomachful of it, then lies down and carves through the veins in his forearms. It’s a protracted and painful sequence, particularly given how lovable actor Paul Ready has made this character all season long. In a way, it echoes the one act of completely understandable cruelty we’ve seen him engage in, his use of the ship’s pet monkey to test the poisonous content of the crew’s food; I’m sure the similarity was not lost on a man this observant of others’ suffering. Finally, in a surreal sequence that stuns in the same way the deaths of Sir John Franklin and Mr. Collins did previously, Goodsir is afforded a glimpse of what his medical mind might well view as the sublime, or even the divine: a flower, a seashell, and a crystal, against a field of blinding white. No loved ones await him in the light, no flight of angels sings him to his rest. All he sees are a vegetable, an animal, and a mineral—merely the contents of the entire known world, reduced to their beautiful quintessence. He’s cared for so many people all these years; in his final moments, his own mind cares for him. Mr. Hickey’s death feels equally fitting for opposite reasons. By the time of his demise, the bloom is well and truly off the rose for his stint as leader. He’s beaned his right-hand man, Sgt. Tozier, right on the head, and the man is now openly questioning his leadership. (“I don’t see any method at all, sir.”) Many of his other followers are dying or going insane or both as the result of consuming Goodsir’s poison body. Hickey himself reveals the murderous deception that landed him on board in the first place when he tells the story of how “a man called Cornelius Hickey” told him about the expedition’s hoped-for tropical endpoint, enticing him to kill the guy and enlist in his place. “You could have just joined up,” Crozier heckles in response, one of the funniest lines in the whole series. With his exhausted followers and captives arranged around him in the arctic half-light like a natural history museum tableau, Hickey stands on his boat as a would-be conqueror, arms outstretched, attempting to lead a rousing rendition of the national anthem. When, inevitably, the Tuunbaq arrives to destroy these intruders once and for all, Hickey’s delusions of grandeur kick into overdrive. Cursing God, Queen, and country—“our empire is not the only empire, I’ve seen that now”—he attempts to commune with the divine himself, cutting off his tongue and offering it to the rampaging beast as a would-be shaman. The Tuunbaq simply eats him, and because of all the people and metal and poison it’s ingested during the course of the attack, this meal he makes of the most toxic member of the entire crew effectively chokes him to death. But other deaths are harder to make peace with. The one that upsets me most is Lt. Jopson’s. Loyal to Crozier even through the worst of his alcoholism, he saw something in the Captain few if any others could see, even Crozier himself. His patience was rewarded with Francis’ flowering as a caring, competent, and courageous commander—the best kind of first, to paraphrase his fellow captains Franklin and Fitzjames. It was rewarded again when Francis made the unprecedented move of promoting him to lieutenant, with the admiration and approval of every other surviving officer. It was rewarded a third time when Francis returned the favor Jopson had done him during his detoxification, tending to him and telling him stories to keep up his spirits as the malnutrition, exhaustion, and lead poisoning took its horrible toll on Jopson’s body. It’s not merely a tragedy, then, that Jopson dies the way he does: believing that Crozier has deliberately abandoned him to die, when the Captain had already been kidnapped and it was in fact the decision of the other men to disobey his instructions about leaving men behind. Jopson’s dying act is to crawl out of his tent and across a hallucinatory banquet table, at the head of which he imagines his beloved Captain, well-fed and oblivious to his suffering. He goes to his un-grave believing the person he believed to be his friend condemned him to death. Unless you believe in an afterlife—and the claustrophobic cosmology of this show is such that it can be agnostic about the afterlife at best, since anything firmer would constitute an escape hatch for the characters—no one will ever tell Jopson the truth of the matter. He dies wrong. He is hardly alone. When Crozier and Silence come across the camp of his ostensible loyalists—the men who stuck by his side against Hickey’s mutineers—he finds a cannibalistic charnel house that puts even the worst of Hickey’s depravity to shame. Bodies and body parts are strewn around; I think a severed shinbone, the flesh still hanging off it, is sticking out of a cooking pot. When Crozier finally finds Lt. Little, the man he believed with absolute certainty would rally the crew and come to the rescue of all of Hickey’s hostages, he discovers the man barely clinging to life, glassy-eyed, his face a web of golden chains and piercings, like a deranged pirate king. “Close,” he whispers to Crozier before dying. Wrong again. Thus, the stakes of this story’s final act, the battle between Hickey’s sociopathy and Crozier’s decency—it’s all a sick joke. If this is what Crozier’s men became, the same thing could become of anyone, “Cornelius Hickey” or no. This is what I see reflected in Crozier’s final decision to abandon the Navy, England, his old way of life. Certainly his decision to hide from the men sent to search for him stems in part from dread at the prospect of explaining what happened, of revealing the extent of the horror, human and otherwise. But I also think it comes down to Anton Chigurh’s eternally applicable question: “If the rule you followed brought you to this, of what use was the rule?” Crozier saw “civilized” society, represented in microcosm by the institution intended to bring that civilization to the four corners of the globe, collapse when confronted with something it could not understand, turn on itself, go septic. “Western civilization” is a tin of meat, its bargain-price purchase approved by all the proper channels, concealing sickness and madness and rottenness inside. Crozier has eaten his fill. Maybe this is why he is able to accept the death of his rescuer, Lady Silence, whose real name, as he learns in a joyous and bittersweet moment of recognition, is Silna. Silence finds him, severs his hand to free him from the chain that still links him to the carcass of the creature, treats his many wounds, nurses him back to health, brings him through the wreckage of the camps, takes him back to her own settlement. But as a failed shaman, she has to abandon herself to the elements and die along with the monster she failed to control and protect. “Everyone accepts this,” the settlement’s leader tells Francis as he frantically tries to find out which way she went. “You must remember where you are and accept this also.” Then he hands Crozier a small wooden carving Silence—Silna—made of one of his boats. Silna’s acceptance of this custom and her own death is no more outlandish than that of the men who stayed behind with the ships just in case, but most likely were guaranteed to perish there. And her care for at least some of the men of that voyage, Crozier and Goodsir chief among them, is not invalidated by her willingness to die, anymore than her death could make that little wooden boat disappear. It’s all real. It all must be accepted. This leaves us with two final characters to talk about: Crozier, and the Tuunbaq himself. Only Crozier survives the final battle close enough to the creature to witness its death, which he helps along by yanking on the chain that clogs its guts. In death, the Tuunbaq is revealed to be pitifully mortal. Its stubbed snout and big eyes give it a grotesquely humanoid look, a stupid cave-troll brute. His body bears scars and burns from all the damage he incurred battling with Crozier’s men. As Hickey figured out, it’s suffering from the same poisoning the whole crew are, thanks to ingesting so many of them; the forks tied to Mr. Blanky and the chain it gobbled up while eating the men attached to it helped it along too. Silna’s face when she sees it, crinkling into wordless grief, says it all. (As she’s been throughout the series, actor Nive Nielsen is so expressive with so little to express herself with.) This creature doesn’t understand his own death any more than any of the men did. If you took all the disparate death scenes on this episode and jammed them into the Tuunbaq’s brain, you’d get that same look of utter, vulnerable confusion. Unlike the Tuunbaq, Crozier lives. Our final glimpse of him is the final shot of the series: He sits on the ice, fishing harpoon nearby, eyes closed, a little boy snuggled up next to him. He’s a member of the Netsilik now, it seems, though he’s no captain or chieftain, let alone the shaman he becomes in the book. He’s just some guy taking a kid out fishing. Actor Jared Harris radiates weariness right through Crozier’s furs, and the truly vast emptiness that surrounds him makes this final pseudo-religious image feel isolated and frightening. Yet the presence of that child mitigates any sense that Francis is alone. His thoughts are opaque to us, but he is alive, and in contact with the living. As this magnificent show closes, it does so without showing us this one final death. It ends not on a period, nor even a question mark, but an ellipsis. 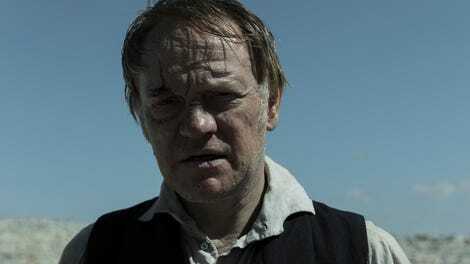 Like the spear lying next to him and the sea creature that will meet it before long, death is a mystery that awaits Captain Francis Crozier in the future, where it awaits all of us too. None, this time. I’d rather hear yours.